We have two new resources to help customers address their data protection requirements in Argentina. These resources specifically address the needs outlined under the Personal Data Protection Law No. 25.326, as supplemented by Regulatory Decree No. 1558/2001 (“PDPL”), including Disposition No. 11/2006. For context, the PDPL is an Argentine federal law that applies to the protection of personal data, including during transfer and processing. A new webpage focused on data privacy in Argentina features FAQs, helpful links, and whitepapers that provide an overview of PDPL considerations, as well as our security assurance frameworks and international certifications, including ISO 27001, ISO 27017, and ISO 27018. You’ll also find details about our Information Request Report and the high bar of security at AWS data centers. Additionally, we’ve released a new workbook that offers a detailed mapping as to how customers can operate securely under the Shared Responsibility Model while also aligning with Disposition No. 11/2006. The AWS Disposition 11/2006 Workbook can be downloaded from the Argentina Data Privacy page or directly from this link. Both resources are also available in Spanish from the Privacidad de los datos en Argentina page. Want more AWS Security news? Follow us on Twitter. Over the past several years, anyone looking for a piracy-configured set-top box could do worse than search for one on Amazon or eBay. 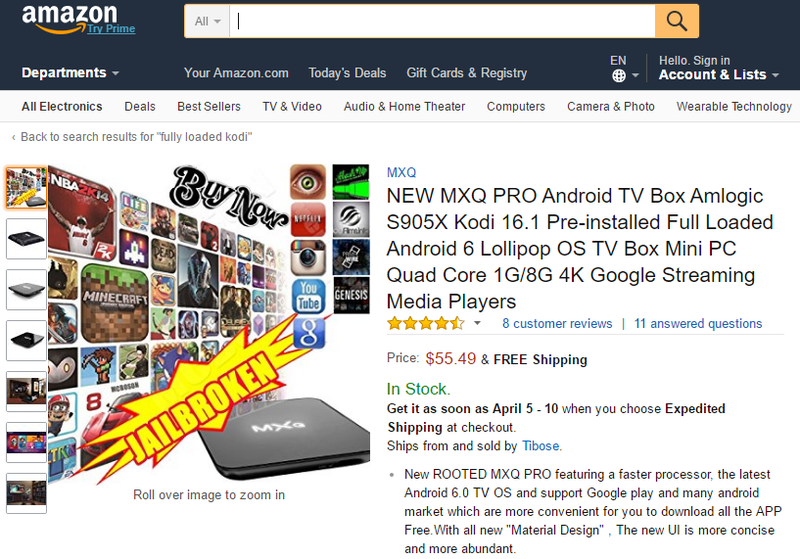 Historically, people deploying search terms including “Kodi” or “fully-loaded” were greeted by page after page of Android-type boxes, each ready for illicit plug-and-play entertainment consumption following delivery. Although the problem persists on both platforms, people are now much less likely to find infringing devices than they were 12 to 24 months ago. Under pressure from entertainment industry groups, both Amazon and eBay have tightened the screws on sellers of such devices. Now, however, both companies have received requests to stem sales from a completetey different direction. In a letter to eBay CEO Devin Wenig and Amazon CEO Jeff Bezos first spotted by Ars, FCC Commissioner Michael O’Rielly calls on the platforms to take action against piracy-configured boxes that fail to comply with FCC equipment authorization requirements or falsely display FCC logos, contrary to United States law. “Disturbingly, some rogue set-top box manufacturers and distributors are exploiting the FCC’s trusted logo by fraudulently placing it on devices that have not been approved via the Commission’s equipment authorization process,” O’Rielly’s letter reads. As noted above, both Amazon and eBay have taken steps to reduce sales of pirate boxes on their respective platforms on copyright infringement grounds, something which is duly noted by O’Rielly. However, he points out that devices continue to be sold to members of the public who may believe that the devices are legal since they’re available for sale from legitimate companies. “For these reasons, I am seeking your further cooperation in assisting the FCC in taking steps to eliminate the non-FCC compliant devices or devices that fraudulently bear the FCC logo,” the Commissioner writes (pdf). In the event that Amazon and eBay take action under this request, O’Rielly asks both platforms to hand over information they hold on offending manufacturers, distributors, and suppliers. Amazon was quick to respond to the FCC. In a letter published by Ars, Amazon’s Public Policy Vice President Brian Huseman assured O’Rielly that the company is not only dedicated to tackling rogue devices on copyright-infringement grounds but also when there is fraudulent use of the FCC’s logos. Noting that Amazon is a key member of the Alliance for Creativity and Entertainment (ACE) – a group that has been taking legal action against sellers of infringing streaming devices (ISDs) and those who make infringing addons for Kodi-type systems – Huseman says that dealing with the problem is a top priority. “Our goal is to prevent the sale of ISDs anywhere, as we seek to protect our customers from the risks posed by these devices, in addition to our interest in protecting Amazon Studios content,” Huseman writes. “In 2017, Amazon became the first online marketplace to prohibit the sale of streaming media players that promote or facilitate piracy. To prevent the sale of these devices, we proactively scan product listings for signs of potentially infringing products, and we also invest heavily in sophisticated, automated real-time tools to review a variety of data sources and signals to identify inauthentic goods. Huseman also reveals that since implementing a proactive policy against such devices, “tens of thousands” of listings have been blocked from Amazon. In addition, the platform has been making criminal referrals to law enforcement as well as taking civil action (1,2,3) as part of ACE. “As noted in your letter, we would also appreciate the opportunity to collaborate further with the FCC to remove non-compliant devices that improperly use the FCC logo or falsely claim FCC certification. If any FCC non-compliant devices are identified, we seek to work with you to ensure they are not offered for sale,” Huseman concludes. Today, we’re happy to announce that the AWS GDPR Data Processing Addendum (GDPR DPA) is now part of our online Service Terms. This means all AWS customers globally can rely on the terms of the AWS GDPR DPA which will apply automatically from May 25, 2018, whenever they use AWS services to process personal data under the GDPR. The AWS GDPR DPA also includes EU Model Clauses, which were approved by the European Union (EU) data protection authorities, known as the Article 29 Working Party. This means that AWS customers wishing to transfer personal data from the European Economic Area (EEA) to other countries can do so with the knowledge that their personal data on AWS will be given the same high level of protection it receives in the EEA. As we approach the GDPR enforcement date this week, this announcement is an important GDPR compliance component for us, our customers, and our partners. All customers which that are using cloud services to process personal data will need to have a data processing agreement in place between them and their cloud services provider if they are to comply with GDPR. As early as April 2017, AWS announced that AWS had a GDPR-ready DPA available for its customers. In this way, we started offering our GDPR DPA to customers over a year before the May 25, 2018 enforcement date. Now, with the DPA terms included in our online service terms, there is no extra engagement needed by our customers and partners to be compliant with the GDPR requirement for data processing terms. AWS will process customer data only in accordance with customer instructions. AWS has implemented and will maintain robust technical and organizational measures for the AWS network. AWS will notify its customers of a security incident without undue delay after becoming aware of the security incident. AWS will make available certificates issued in relation to the ISO 27001 certification, the ISO 27017 certification, and the ISO 27018 certification to further help customers and partners in their own GDPR compliance activities. Customers who have already signed an offline version of the AWS GDPR DPA can continue to rely on that GDPR DPA. By incorporating our GDPR DPA into the AWS Service Terms, we are simply extending the terms of our GDPR DPA to all customers globally who will require it under GDPR. AWS GDPR DPA is only part of the story, however. We are continuing to work alongside our customers and partners to help them on their journey towards GDPR compliance. Interested in AWS Security news? Follow the AWS Security Blog on Twitter. Sci-Hub is often referred to as the “Pirate Bay of Science”. Like its namesake, it offers masses of unlicensed content for free, mostly against the wishes of copyright holders. While The Pirate Bay will index almost anything, Sci-Hub is dedicated to distributing tens of millions of academic papers and articles, something which has turned itself into a target for publishing giants like Elsevier. Sci-Hub and its Kazakhstan-born founder Alexandra Elbakyan have been under sustained attack for several years but more recently have been fending off an unprecedented barrage of legal action initiated by the American Chemical Society (ACS), a leading source of academic publications in the field of chemistry. After winning a default judgment for $4.8 million in copyright infringement damages last year, ACS was further granted a broad injunction. It required various third-party services (including domain registries, hosting companies and search engines) to stop facilitating access to the site. This plunged Sci-Hub into a game of domain whac-a-mole, one that continues to this day. Determined to head Sci-Hub off at the pass, ACS obtained additional authority to tackle the evasive site and any new domains it may register in the future. While Sci-Hub has been hopping around domains for a while, this week a new development appeared on the horizon. Visitors to some of the site’s domains were greeted with errors indicating that the domains’ security certificates had been revoked. Tests conducted by TorrentFreak revealed clear revocations on Sci-Hub.hk and Sci-Hub.nz, both of which returned the error ‘NET::ERR_CERT_REVOKED’. These certificates were first issued and then revoked by Comodo CA, the world’s largest certification authority. TF contacted the company who confirmed that it had been forced to take action against Sci-Hub. 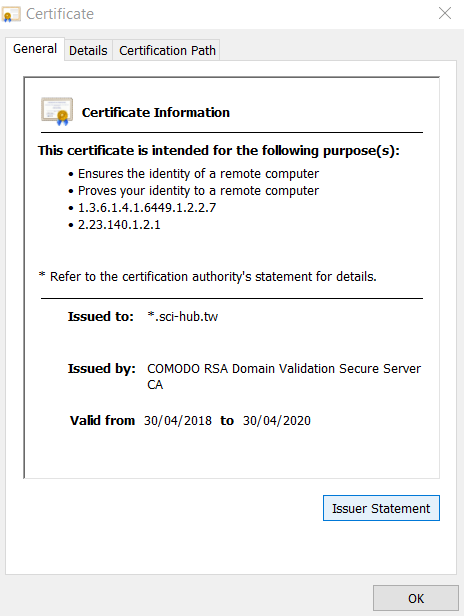 “In response to a court order against Sci-Hub, Comodo CA has revoked four certificates for the site,” Jonathan Skinner, Director, Global Channel Programs at Comodo CA informed TorrentFreak. Comodo refused to confirm any additional details, including whether these revocations were anything to do with the current ACS injunction. However, Susan R. Morrissey, Director of Communications at ACS, told TorrentFreak that the revocations were indeed part of ACS’ legal action against Sci-Hub. “[T]he action is related to our continuing efforts to protect ACS’ intellectual property,” Morrissey confirmed. Sci-Hub operates multiple domains (an up-to-date list is usually available on Wikipedia) that can be switched at any time. At the time of writing the domain sci-hub.ga currently returns ‘ERR_SSL_VERSION_OR_CIPHER_MISMATCH’ while .CN and .GS variants both have Comodo certificates that expired last year. When TF first approached Comodo earlier this week, Sci-Hub’s certificates with the company hadn’t been completely wiped out. For example, the domain https://sci-hub.tw operated perfectly, with an active and non-revoked Comodo certificate. 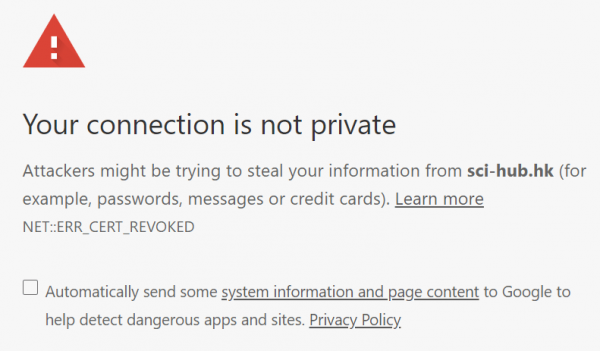 By Wednesday, however, the domain was returning the now-familiar “revoked” message. These domain issues are the latest technical problems to hit Sci-Hub as a result of the ACS injunction. In February, Cloudflare terminated service to several of the site’s domains. “Cloudflare will terminate your service for the following domains sci-hub.la, sci-hub.tv, and sci-hub.tw by disabling our authoritative DNS in 24 hours,” Cloudflare told Sci-Hub. While ACS has certainly caused problems for Sci-Hub, the platform is extremely resilient and remains online. The domains https://sci-hub.is and https://sci-hub.nu are fully operational with certificates issued by Let’s Encrypt, a free and open certificate authority supported by the likes of Mozilla, EFF, Chrome, Private Internet Access, and other prominent tech companies. It’s unclear whether these certificates will be targeted in the future but Sci-Hub doesn’t appear to be in the mood to back down. Good news for cloud security experts: the AWS Certified Security — Specialty exam is here. This new exam allows experienced cloud security professionals to demonstrate and validate their knowledge of how to secure the AWS platform. The security exam covers incident response, logging and monitoring, infrastructure security, identity and access management, and data protection. The exam is open to anyone who currently holds a Cloud Practitioner or Associate-level certification. We recommend candidates have five years of IT security experience designing and implementing security solutions, and at least two years of hands-on experience securing AWS workloads. We have training and other resources to help you prepare for the exam. Learn more and register here, and please contact us if you have questions about exam registration.